Recently, micro-droplet dispensation has been required in printed-electronics (PE) technology. 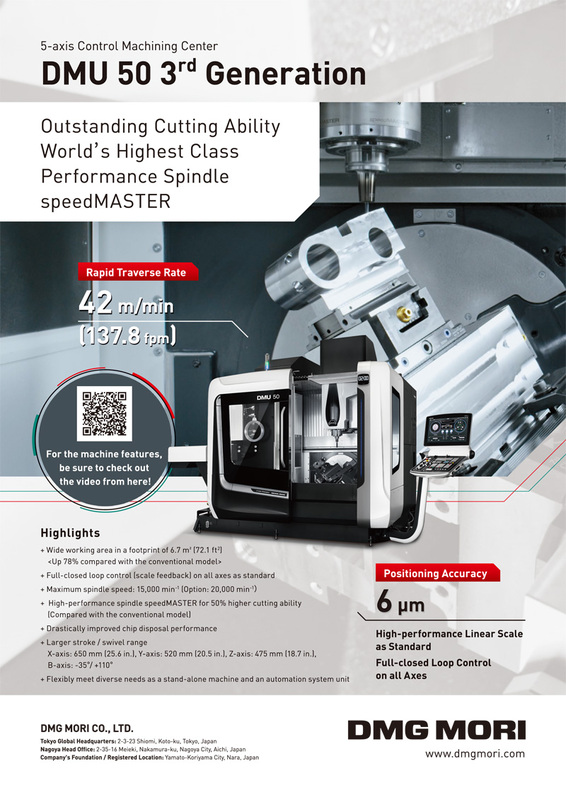 Devices with micro dispensing mechanism are of key importance in achieving a higher performance with these products. In fact, it is very difficult for the conventional dispenser to squeeze highly viscous liquid with picoliter resolution. 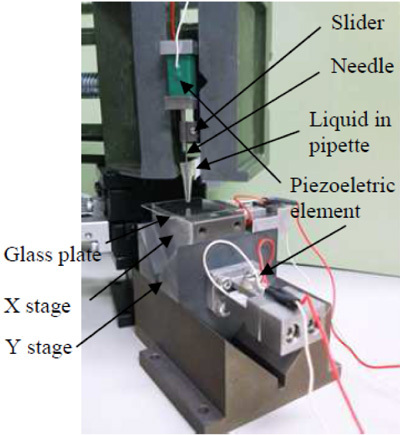 This paper describes the development of a dispensing mechanism comprising a dispensing device and XY stage, both driven by the piezo impulsive force. The dispensing device is mainly composed of a pipette and a taper needle that is driven by a piezoelectric element. When the needle passes through the pipette, a droplet of the liquid adheres to the needle-tip end. A micro droplet can be transcribed to a target surface by bringing the droplet at the needle-tip end in contact with the target surface. On the contrary, in the XY stage, the small tables on the V-shaped grooves can be driven by the impulsive force generated by the mass connected to the piezoelectric element. The X stage is stacked on the Y stage, which allows fine positioning in the plane. In the experiment, an array of a small amount of 0.2-picoliter droplets was successfully developed on the glass plate. T. Imai, “Printed Electronics,” Fujikura Technical Review, Vol.2, pp. 63-66, 2012. K. Suzuki, K. Tsuji, A. Onodera, and T. Shibuya, “High-resolution Patterning Technologies using Ink-jet Printing and Laser Processing for Organic TFT Array,” Society for imaging science and technology, NIP 29 and Digital Fabrication 2013, pp. 489-493, 2013. R. Yalla, K. P. Nayak, and K. Hakuta, “Fluorescence photon measurements from single quantum dots on an optical nanofiber,” OPTICS EXPRESS, Vol.20, No.3, pp. 2932-2941, 2012. K. Suganuma, T. Kanzawa, D. Goto, J. Narui, and T. Otsuki, “Development of Printable Electronics for Circuit Formation,” Fujitsu Ten Technical J., pp. 37-39, 2012. T. Seto, K. Takagi, K. Yoshida, J.-H. Park, and S. Yokota, “Development of High-Power Micropump Using Inertia Effect of Fluid for Small-Sized Fluid Actuators,” J. of Robotics and Mechatronics, Vol.15, No.2, pp. 128-135, 2003. K. Yamamoto, H. Otaki, and Y. Ishikawa, “Moving mechanism using inertia,” The Japan Society of Mechanical Engineers, Vol.57, pp. 1854-1859, 1991. H. Isobe, S. Kato, A. Kyusojin, and T. Moriguti, “Development of piezoelectric XYγ positioning device using impulsive force (2nd report) – Improvement of motion characteristic with friction control –,” The Japan Society of Precision Engineering, Vol.64, No.3, pp. 408-412, 1998. Y. Nomura and H. Aoyama, “Development of Inertia Driven Micro Robot with Nano Tilting Stage for SEM Operation,” Proc. of ASME/JSME Joint Conf. on Micromechanics for Information and Precision Equipment (MIPE 2006), 2006. M. Takizawa, Y. Irie, S. Hirata, and H. Aoyama, “Development of hemispherical manipulator and self-walking stage using piezoelectric actuator,” 3rd Int. Conf. of Asian Society for Precision Engineering and Nanotechnology (ASPEN2009), Station Hotel Kokura, p. 1E6, 2009. H. Shiratori, M. Takizawa, Y. Irie, S. Hirata, and H. Aoyama, “Development of the Miniature Hemispherical Tilt Stage Driven by Stick-slip Motion using Piezoelectric Actuators,” Mecatronics-REM2012, France, 2012. T. Higuchi and Y. Yamagata, “Micro robot arm utilizing rapid deformations of piezoelectric elements,” J. of Robotics and Mechatronics, Vol.1, No.4, pp. 94-99, 1989. K. Uchino, “Piezoelectric actuators 2006 Expansion from IT/robotics to ecological/energy applications,” J. Electroceram, Vol.20, pp. 301-311, 2008. Y. Tadano, R. Yoshida, and T, Morita, “Simulation modeling for resonance-type SIDM actuator,” The Japan Society of Precision Engineering, pp. 183-184, 2013. NEC/TOKIN, “Multilayers piezoelectric actuators, Vol.07,” Product catalog, p. 11. Y. Irie, J. Kubo, T. Fujioka, H. Aoyama, and T. Usuda, “Piezo-impact-driven X-Y stage and precise sample holder for accurate microlens alignment,” J. of Rbotics and Mechatronics, Vol.21, No.5, pp. 635-641, 2009. S. Hirata, K. Hirose, Y. Irie, and H. Aoyama, “Evaluation of micro-gap control of the needle-type dispenser for precise micro-droplet dispensation,” J. of Robotics and Mechatronics, Vol.25, No.5 pp. 848-854, 2013.